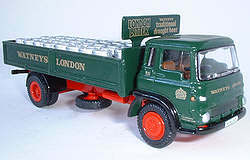 The Bedford TK range of trucks with their roomy cabs were introduced in the 1960's. The chassis had it's engine mounted vertically under the rear of the cab which was accessed was via a flap on the rear of the cab. The TK was supplied on various lengths of chassis, and could be fitted with a wide range of different body types. The popular TK remained in the Bedford range until the late 1970's and was still a common sight on British roads well into the late 1980's. All the the EFE TK models have been produced as two axle vehicles, these come in four chassis lengths - Short , short rigid, long rigid and aticulated tractor unit. So far tanker versions of the TK have only been produced in the articulated form. 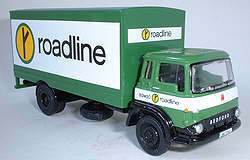 The Bedford TK is also the only truck model to be issued with a draw bar boxvan trailer to date. The truck range took a back seat during the period around 2000 when EFE was suffering some uncertainties following problems at the then parent ERA Group. However a number of TK models were produced for the Gilbow Railway Collection range and the normal truck range has also since 2004 been given a much higher profile once again. Please note that the release months shown on some of the model pages, are based on those printed on EFE release sheets, the actual release month may have been later in some cases.